It’s full on fall here, and after a week or so of unseasonably warm weather, we’re finally getting frost warnings at night. (Breaking into hard frost season is kind of a big deal here in Tennessee). 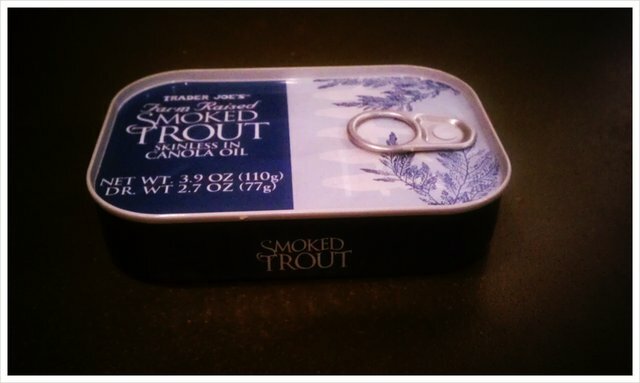 Accordingly, I was in the mood for something smokey and comforting last night, and so I reached for a tin of smoked trout from good ‘ole Trader Joe’s. This is an ad-libbed recipe, but I’ve made something similar before, inspired by a potato salad recipe my mom always made growing up with a delicious and strong-handed Dijon vinaigrette. This combo is one of my favorites, and it manages to be comfort food without being very heavy. You could substitute in any number of steamed veggies, and/or add in some chickpeas or white beans for more protein. Lots of fresh basil if it were still summertime, would also make for a nice addition. In the winter, parsley would be a great substitute. The steaming of the veggies is the thing that takes the longest, making this a fast recipe to throw together. Put a metal steamer basket in a large pot on the stove and bring a small amount of water in the bottom to a boil. Add the potatoes to the pot and cover with a lid. While the potatoes are steaming, whisk together the mustard and vinegar, adding a pinch of salt and a few generous grinds of pepper. Slowly whisk in the olive oil till emulsified. When the potatoes are tender, about 10-12 minutes or so, remove from pan. While still hot, trying not to burn off your fingers, half or slice potatoes into thirds, and toss with the vinaigrette. Add the broccoli to the steamer basket and steam for 3 minutes. Remove broccoli and dice and add to potatoes and vinaigrette. Toss the feta with the vegetable mixture. Drain the oil out of the trout and then flake with a fork and toss with the veggie mixture. Finally, add in the arugula and cucumber, and combine thoroughly. Serve slightly warm or at room temperature. I think it is safe to say that everyone has been a little MIA around here. Work, travel, just plain life have been keeping us all busy, I know. Nevertheless, I thought I’d try and get at least a quick post up to say “hi” and to let everyone know what’s been going on in our kitchen lately. We’ve both been working more and doing errands, like grocery shopping, less. Needless to say, more than ever, I’ve been digging through the dregs of the fridge for meal inspiration. The other day, while perusing the random magazine available at the YMCA as I was working out, I came across a recipe for a salad with peaches and pomegranate molasses. The combo of sweet and sour sounded perfect (as you know, I’m a pomegranate molasses addict), and I had two peaches at home just on the verge of being too ripe. And that’s how this salad was born. We both really, really enjoyed it, so I’ll be making the salad and the vinaigrette again soon. Since peach season is pretty much done, I encourage you to substitute in other veggie or fruit for the peaches–a honeycrisp apple or some roasted or raw fennel. Whisk together the pom molasses, balsamic vinegar, and Dijon until combined. Slowly whisk in olive oil until emulsified. Season to taste with salt and pepper. Toss the rest of the ingredients with the dressing until coated. It is hot, hot, hot in Knoxville, just like much of the States right now, it seems we’re in a perpetual heat wave. No matter–it gives us a chance to check out Tennessee swimming holes this weekend. In the meantime, salads seem to fit the bill in terms of most of our meals. Again, I was digging through the bountiful produce from my Aunt and Uncle’s garden that they passed along, including a large bag of yellow squash. I rarely get inspired by recipes on Pinterest (seems like an awful lot of people are in love with chocolate concoctions and casseroles on there…), but this salad, featuring shaved squash, caught my eye. Using what we had around–spinach, feta, sprouts, tomato, walnuts, and of course, squash–I threw together this salad for lunch. I will definitely make it again. We also ate it with homemade pickled beets from Holly and Jon, which were incredibly delicious (thanks you two!). Just make sure that you use smallish squash–otherwise they’ll be full of seeds and not as appealing. And it goes without saying that you should toss in whatever veggies and substitute in any nuts that you have on hand. Also, the feta dressing would be great on many salads, so I’ll be experimenting with it as well. All measurements are approximate, so adjust accordingly to make the dressing to your taste! Add the spinach to your salad bowl, and after you trim the ends off of the squash, shave it with a vegetable peeler into the bowl. 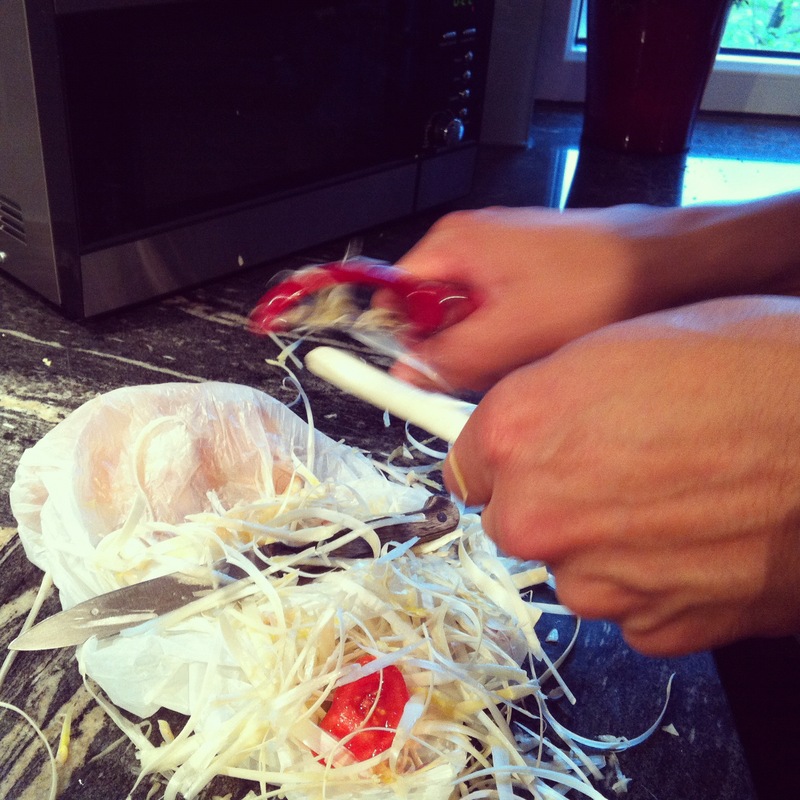 You can simply eat/discard/save for later the seedy middle parts once it gets difficult to shave any further. Toss in the sprouts and tomato. In the meantime, toast the walnuts in a pan over medium-high heat until fragrant and slightly toasted on the outside. While the nuts are toasting (be sure not to let them burn by shaking the pan frequently), you can make the dressing. Add the feta, yogurt, and lemon juice or vinegar to your food processor or blender and mix thoroughly. 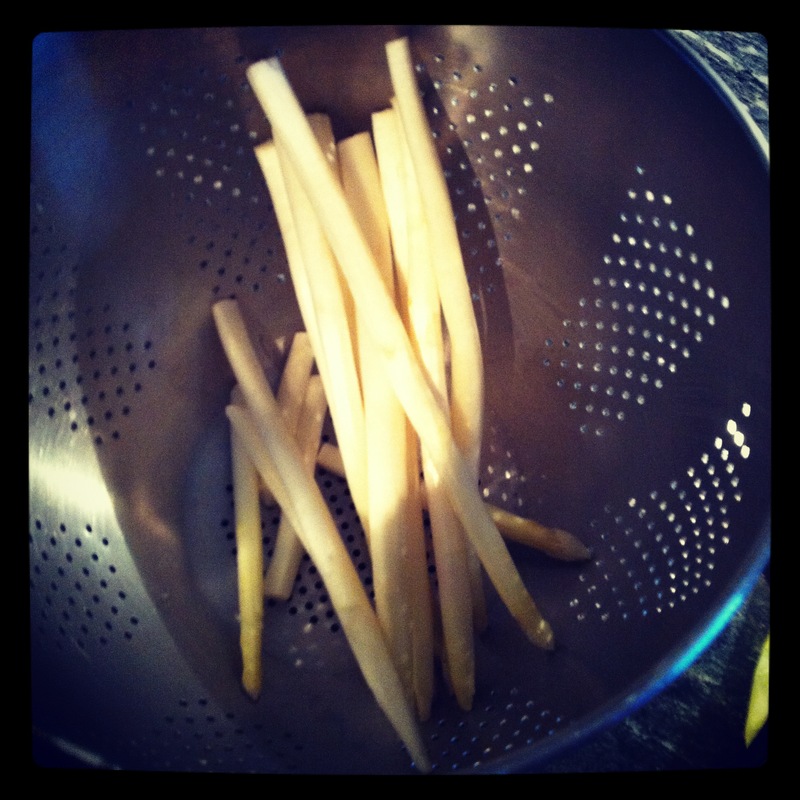 With the motor running, add in a generous glug of olive oil and whiz together. Add the herbs and mix completely. 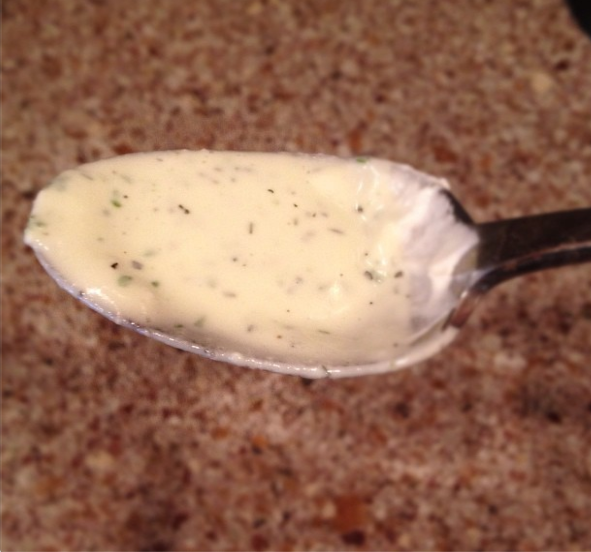 If the dressing needs to be thinned, you can add 1 tsp. of water at a time until it reaches the desired consistency. Toss the dressing with the greens and serve immediately with plenty of salt and pepper. For you meat eaters, grilled chicken or salmon would be a nice way to make this a complete meal. In the meantime, I had a large head of broccoli ready to use up and not a ton else in my fridge, so I came up with this salad. I’m really happy with the taste–the salty and sharp flavor of the olives and Parmesan really make this delicious, and the fine florets really soak up all the dressing. I was going to add in some cherry tomatoes that I had around, but I kind of feel that their texture would interfere with the straightforward crunch this has as-is. Nevertheless, tell me if you improvise and add other things and like it. 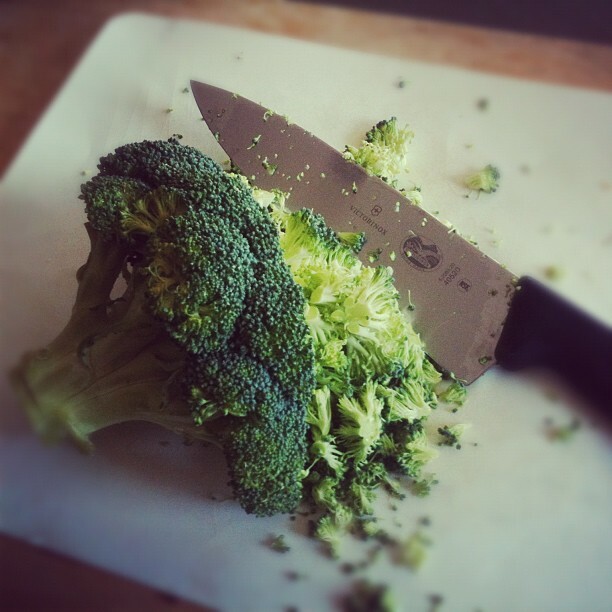 Use a sharp knife to cut the broccoli into small pieces, taking care to really dice it up–large chunks of broccoli won’t be nearly as good or coated with the dressing. Also, my mom taught me way back when that in order to pit an olive, you simply squish it with the flat side of a chef’s knife. The pit is then easily removed from the olive That’s not only a time-saving tip, but a money-saving tip as well, as pitted olives are more expensive, and often not as fine quality as whole ones. Also, it’s important to use real Parmesan here, not the fake stuff. Also, grate it on the coarse side of your grater rather than the finer one so that you can really taste it in the completed salad. Finally, I used rice vinegar because it was all that was left around as we pack up our apartment, and funny enough, I think I prefer it here. It’s not too acidic, which allows you to add enough vinegar to the dressing to coat the broccoli well without the dressing becoming too acrid. That said, I’ve tried it with balsamic, which is good, and I know that red wine vinegar would work well too. This is definitely going in my standard rotation. Hope you enjoy! Make sure that your broccoli is diced finely and then put it in a bowl. If you haven’t already, pit the olives by pressing the flat side of a chef’s knife against them to pop out the pit. 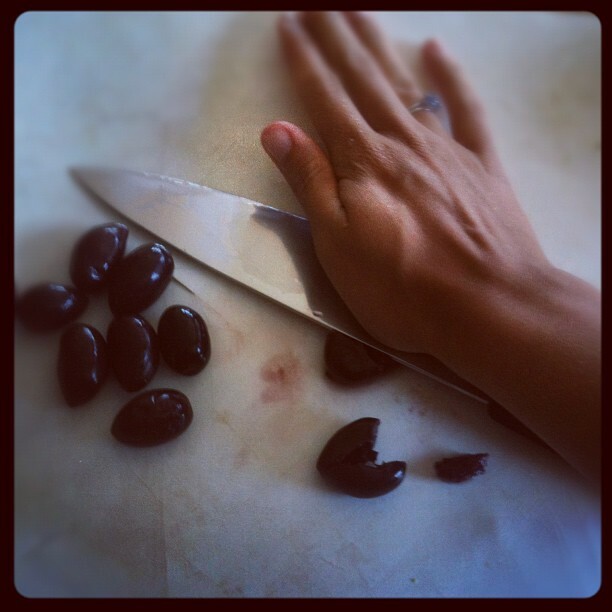 Use your fingers to pull out any straggler pits and then chop the olives coarsely. Combine the broccoli and olives. 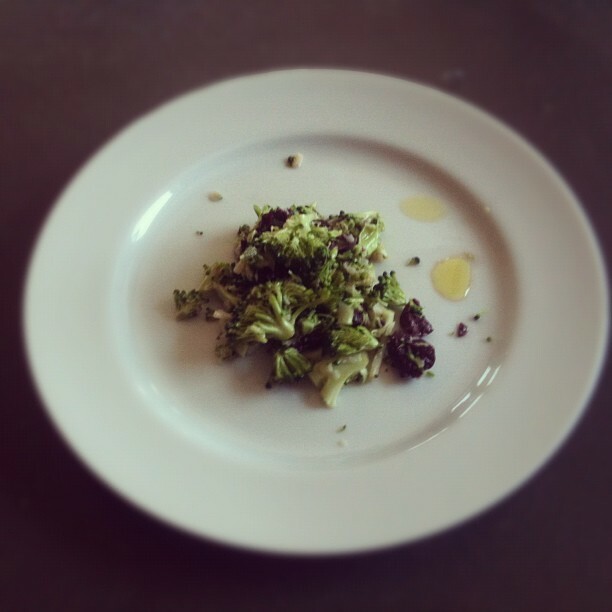 Make the dressing by whisking together the vinegar and olive oil. Toss the broccoli and olives with the dressing and then add the cheese. Thoroughly combine the mixture and taste. Add more vinegar or oil as needed. Taste for salt and pepper and add as needed–be careful since the olives and Parm are quite salty. Serve, with a dash of red pepper flakes or hot vinegar, if desired. Every time I eat kale, something deep in my gut says “gimme more!” I don’t know if it’s some kind of mystery umami, or one of it’s many nutrients (the Iron? the Vitamin K? ), but something in it is so deeply satisfying. There’s nothing new about a kale salad, which seem to be everywhere these days, but this combination of salty feta, rich tahini, and creamy avocado is really addictive. 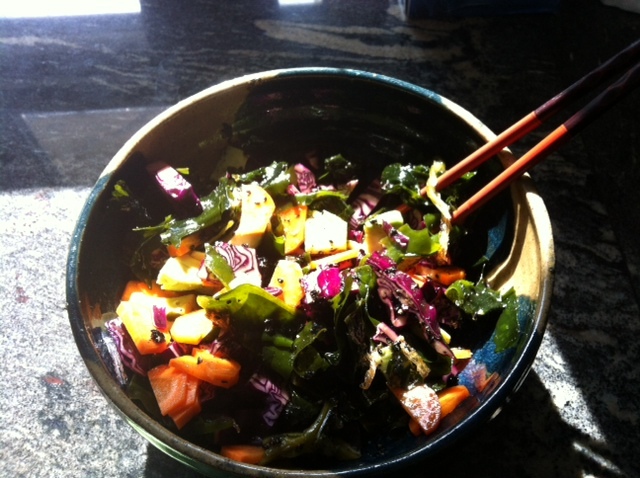 Like my recent Quinoa Veggie Salad, this recipe uses my favorite tahini dressing. First, make the dressing: add the tahini to a bowl or mug and stir in the lemon juice. Beat the mixture until it tightens and turns white. Add a generous sprinkle of salt and pepper. Add a dollop of olive oil, and then slowly stir in a bit of water until the dressing is thinned to salad dressing consistency. Taste for salt, seasoning to taste. 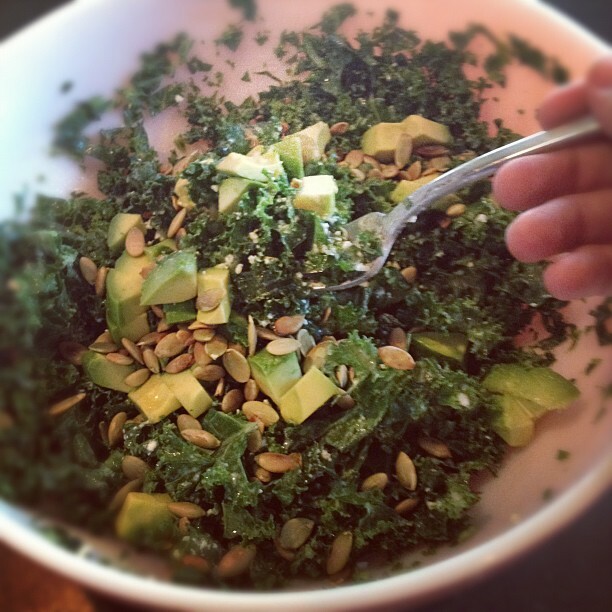 Toss the kale with the tahini dressing until coated evenly. Add the avocado, pumpkin seeds, and feta, and toss until distributed. Taste for salt and pepper, and then serve. 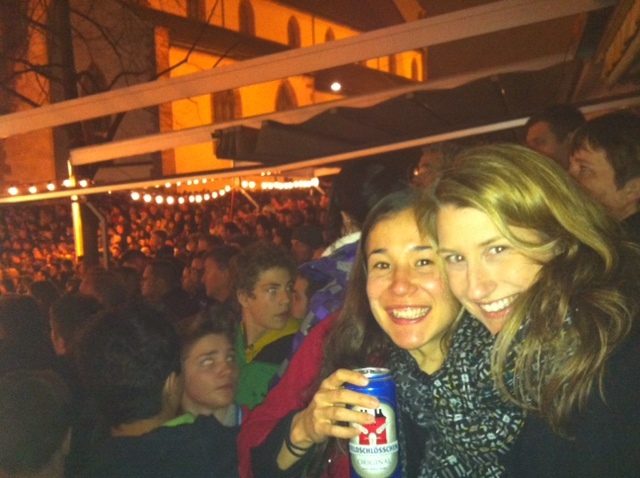 Things have been slow on the blog as we all try and keep up with lots of travel, work, and school. However, I figured it was time for another post, and I wanted to focus on something quick and easy, as that reflects my reality at the moment. As an aside, I just spent a truly wonderful weekend at Aya’s bachelorette party in LA. I feel so lucky to have such incredible women in my life. While in LA, we managed to surf and hike, but also to get only a few hours of sleep each night. We also ate a lot of delicious food, which was a treat, but it was also primarily bread, cheese, chip, and alcohol related 🙂 so I figured I’d try and start my week with something healthy. 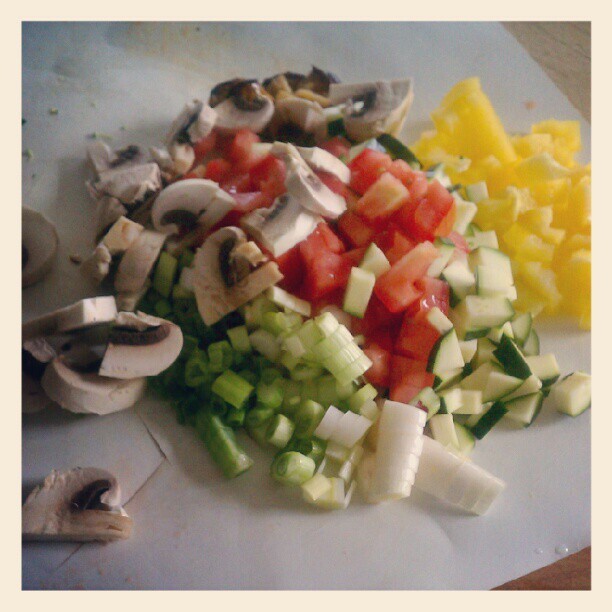 Odds and ends of veggies, cut up and ready for the salad. The following quinoa salad recipe is one of my go-to recipes, and something that I probably eat about once a week. It was inspired by my dear friend, Naseem, who made a variation of it often in grad school. During a period of my life where I lived by myself and I was short on time, it was hard to eat healthy food. Naseem, a true California girl, would invite me over several times a week to shoot the breeze and to cook and eat healthy food. This was one of those recipes that reminds me of those comforting nights sitting in her dining room. I recognized immediately that it would be infinitely useful in my repertoire, and that it was infinitely adaptable to whatever ingredients you have around. 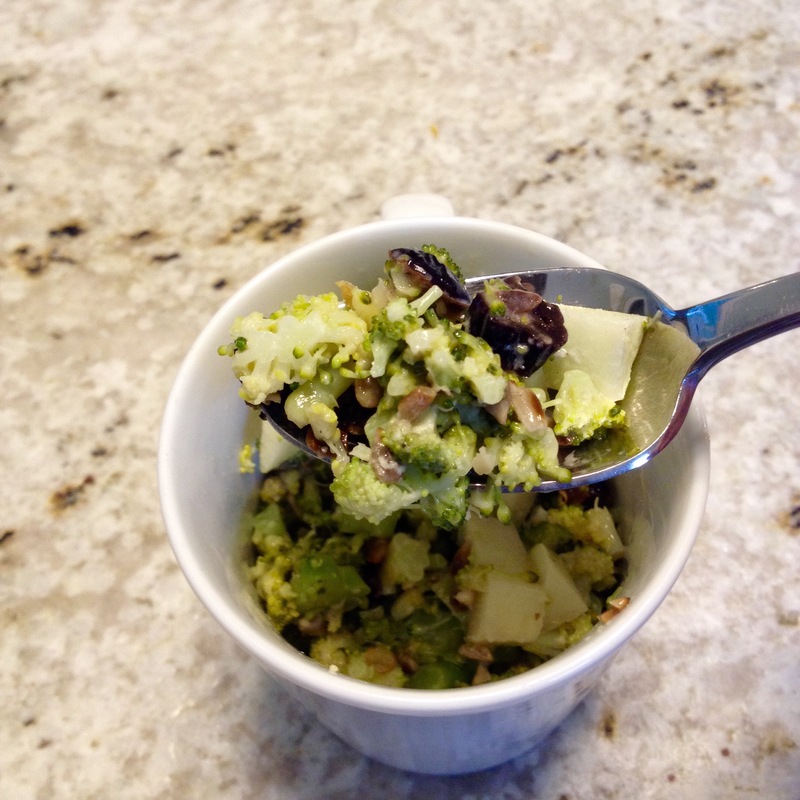 I often make it when I have odds and ends of veggies that need to be used up in the fridge, and when I need a protein kick since quinoa is filled with it. Adding lemon juice to the tahini to tighten the dressing. One note that I learned from one of my favorite chefs, Paula Wolfert. When you make tahini dressing, the best way to do it is to start with the tahini paste, then incorporate your acid (i.e. lemon juice or vinegar). As you stir the mixture vigorously, the tahini will start to turn white instead of tan, and will “tighten up” into a thick paste. Then thin out the dressing with a bit of water and a dollop of olive oil. The resulting dressing will be much more creamy than if you try and mix all of the ingredients together at once. Finally, this dressing is extremely versatile, and I encourage you to try it on everything–steamed or grilled veggies, fish, on salad. It’s one of my favs–unctuous and creamy without being unhealthy or heavy. Hope you enjoy, and let me know if you add any particularly delicious ingredients to this. 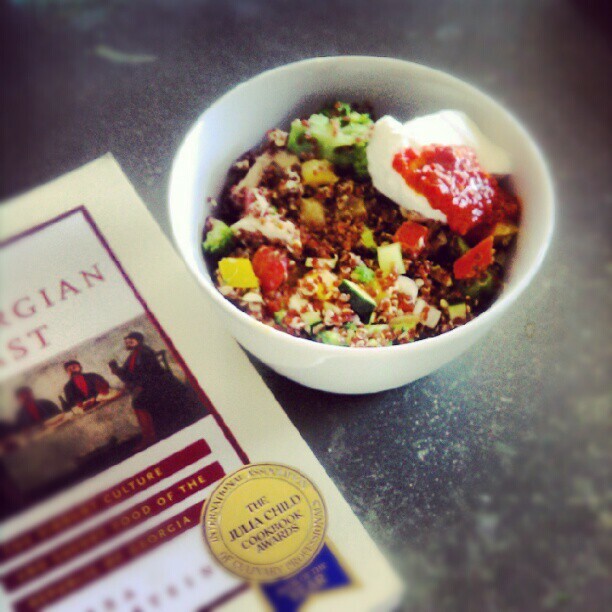 Finished quinoa salad, garnished with yogurt and harissa, and with some lunchtime reading on Georgian cuisine. Add water to a medium saucepan, salt generously, and bring to a boil. In the meantime, chop any veggies that you plan on adding to your quinoa salad. The amount can vary on how densely vegetable-y you want your salad to be. Add the quinoa to the boiling water and simmer for 12-15 minutes or until the quinoa is done. 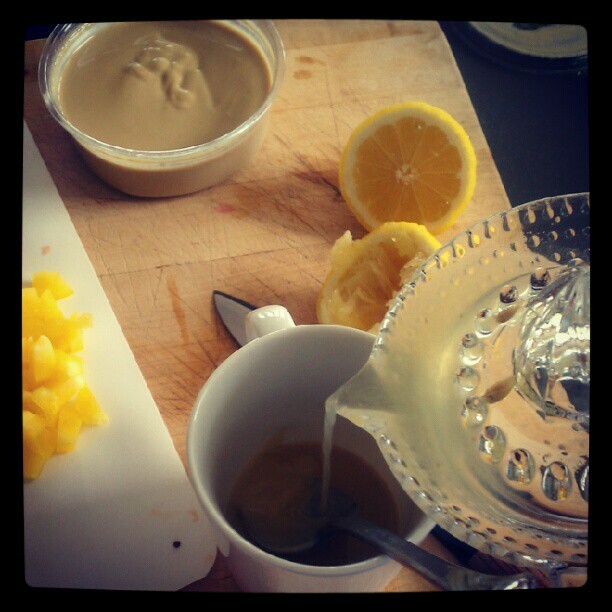 In the meantime, make the dressing: add the tahini to a bowl or mug and stir in the lemon juice. Beat the mixture until it tightens and turns white. Add a sprinkle of salt and pepper. Add a tiny dollop of olive oil (1 tsp. or less? ), and then slowly stir in a tiny bit of water until the dressing is thinned to salad dressing consistency. When the quinoa is done, stir in the chopped veggies while the grain is still hot. Toss all with the tahini dressing and taste for salt and pepper. Stir in fresh herbs, if you’re using. Top each serving of quinoa salad with a dollop of lowfat Greek yogurt, harissa paste, or a poached egg if desired. 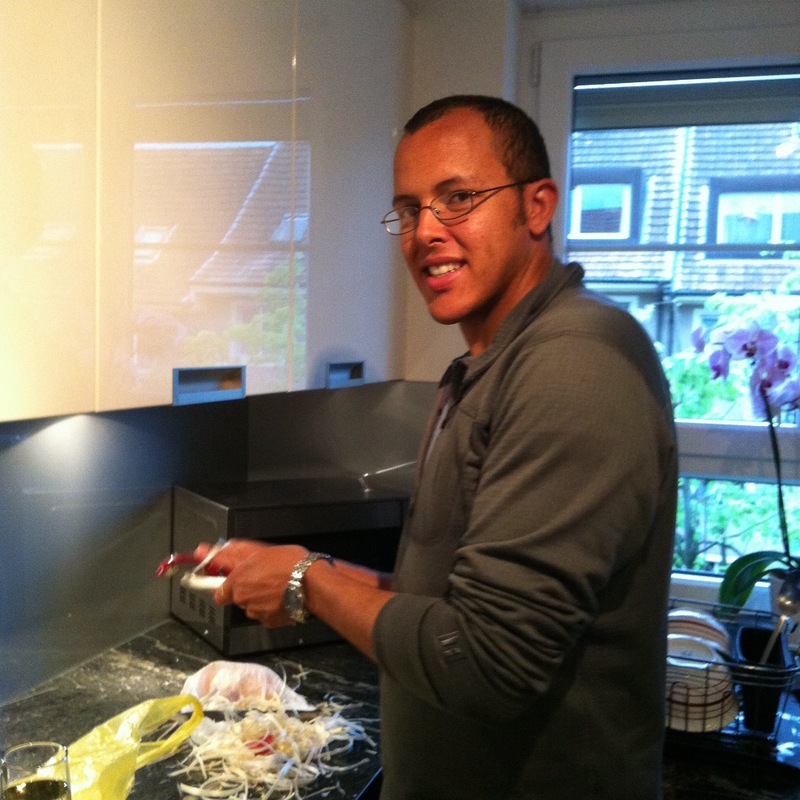 I was a vegetarian for a long time, so I’m still a bit tentative when it comes to cooking fish. 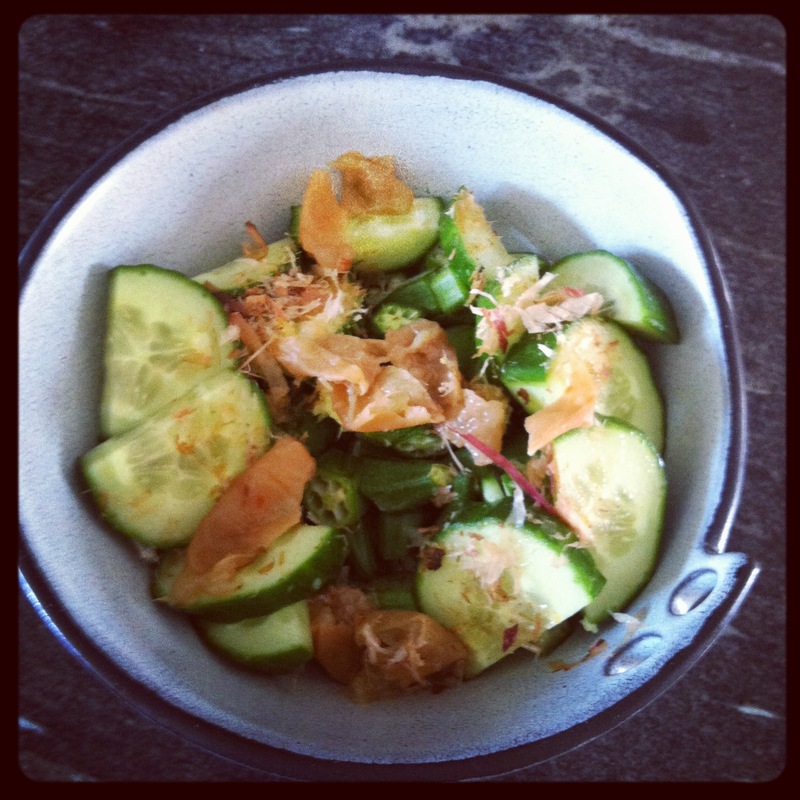 Thus, I’m a big fan of canned tuna fish–it’s easy, it’s cheap, and I can’t screw it up. However, it is full of mercury, which is really bad for you, of course (in fact, a lot of people say that if you’re of childbearing age, you should consider cutting it out, FYI, ladies). And a lot of times, it’s not very environmentally friendly–fishing methods used to catch it are often destructive, bigeye tuna is now overfished, and yellowfin, skipjack and albacore tunas are all in decline. So, when I saw a can of farm raised smoked trout at Trader Joe’s, I figured I’d try it out as a possible tuna substitute. Oh man, is this stuff amazing… So while I try to not eat smoked fish more than a few times a month since they contain a lot of nitrites and nitrates, this tasty fish is now a mainstay in our house. My favorite way to eat it is in salad, and so while you hardly need a recipe for it, here’s my favorite salad, featuring arugula, smoked trout, and toasted pumpkin seeds. Don’t avoid toasting the pumpkin seeds on the stove–it only takes a few moments and they are so, so good roasted in this way. In fact, they’re my secret salad weapon. So many meat eaters who have had a salad with these pumpkin seeds ask me if there is bacon in the salad. Personally I don’t think they taste like bacon (which I never have even liked anyway), but it is a testament to their awesomeness, as most people think bacon is delicious. They add a richness and yes, even meaty, quality to the salad that is really necessary, in my opinion. Okay, on to the recipe. Add the pumpkin seeds to a skillet, and toast over medium high until they start popping, and are browned on all sides. Turn them off before they get too brown, as they will continue to cook off the flame. Cool on a plate. Flake the smoked trout with a fork. 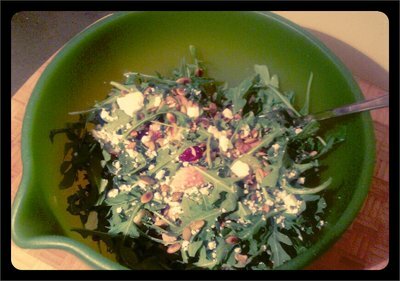 Add the arugula, trout, apple, feta, cranberries, and pumpkin seeds to a large bowl. Add the lemon juice and olive oil (to taste, but somewhere around 1 to 3 acid to oil) along with salt and pepper to a small bowl and whisk with a fork. Add the dressing to salad, toss, and enjoy!